Anyone familiar with the Nikon 1-series camera will immediately recognise the familiar family resemblance, especially in the Nikon 1 J3, where the only real outward difference is the movement of the mode dial to the top of the camera where it’s a little easier to see and access. The main market for these cameras is from photographers looking for higher image quality than a smartphone or traditional compact camera can produce, with the ability to change lenses to suit the conditions. All without needing a large bag like a DSLR. To ensure high image quality, these two models both feature Nikon CX-format CMOS sensors. In the case of the J3, it’s a 14.2-megapixel sensor, while the more consumer oriented S1 features a 10.1-megapixel unit. Image processing is handled by Nikon’s now familiar EXPEED 3A processing engine, so image quality should be good. To cope with low light shooting, both models have expanded ISO ranges – from 160-6400 in the J3 and from 100-6400 on the S1. In use, the large 3inch LCD screen found on each model makes composing images simple and ensures it is easy to see the scene, even when the light levels drop. In a recent DxOMark test we found the Nikon 1 J2 sensor performed reasonably well scored lower than its direct competitors, so hopefully these new models have taken that performance to the next level. Focusing is handled by Nikon’s Advanced Hybrid AF system with a 73-point AF array that works for both static and moving subjects. Nikon have also address one major complaint levelled at compact cameras – the shutter release lag. Both models feature a release time of 80ms, which puts them on par with many high-end DSLR cameras. A maximum of 15 frame-per-second shooting even when using continuous AF ensures that despite their diminutive size, these cameras should still prove their worth in fast moving situations as well as those of a more static nature. Not everyone is a photographic expert, so Nikon have included a slew of user-friendly shooting modes, including scene-selectable creative modes that allow the camera to control how the scene is recorded. For those more familiar photography, there is also the more normal shooting modes of P, Tv, Av and M.
On the movie front, both models feature full HD movie shooting and an Advanced Movie Mode that allows you to record both full HD movies and high resolution stills at the same time. With the ability to capture footage at 400fps and 1200fps, it opens up super-slow motion film capabilities as well. The growth in smartphones has caused manufactures to re-think how compact cameras interact with other devices. Using the optional WU-1b Wireless Mobile Adaptor, it is possible to wirelessly send and share images taken on the camera via a smartphone or tablet. Combined with an App available for both Android and iOS, remote wireless control of the camera is also possible, so you don’t even need to be next to your camera to take a picture. With more people taking up water sports and the rise of action cameras, Nikon have also announced a new WP-N2 underwater case that fits both the S1 and J3 models. When used with a 1 NIKKOR 10-30mm lens it is even possible to zoom in an out while underwater. Waterproof down to 40m, it should prove useful whether you’re snorkeling or just heading to the beach for the day. Both cameras will be available as part of lens kits in February 2013. 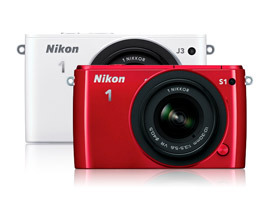 The Nikon 1 J3 carries a suggested retail price, with a 10-30mm lens, of $599.95 USD. The more consumer focused Nikon 1 S1 with an 11-27.5mm lens has a suggested retail price of $499.95 USD.